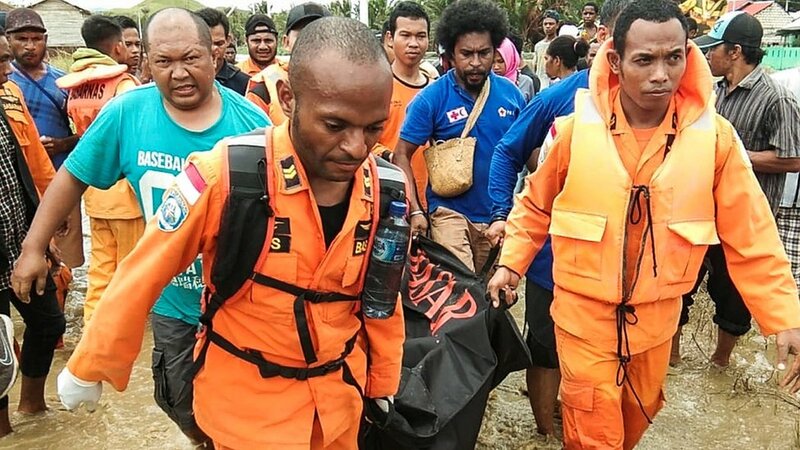 At least 73 people have died and more than 60 are missing in flash floods in Indonesia’s eastern province of Papua. “Our house was flooded with thick mud… we immediately grabbed our valuables and ran to a neighbour’s [two-storey] house to seek refuge,” mother-of-two Lili Puji Hastuti told AFP news agency. At least 51 people were killed in the town, national disaster agency spokesman Sutopo Purwo Nugroho told Reuters news agency. Another seven confirmed deaths were in the nearby provincial capital Jayapura, Mr Nugroho added. The baby was later reunited with his family. His father survived but his mother’s whereabouts is unknown.